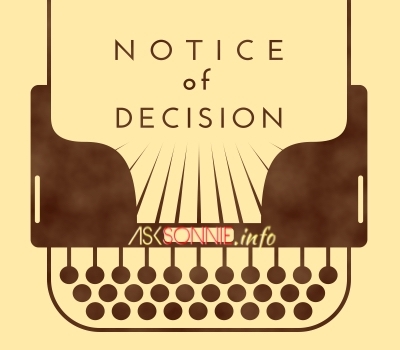 A notice of decision memo is the document containing the decision agreed upon, after conducting an administrative investigation. It’s a legal requirement being the second of the twin-notice rule. Basis of the Notice of Decision is the case report written by the Labor/Industrial Relations (LR or IR) or Human Resource (HR) head submitted and approved by top management. What factors led to the incident to occur? What mitigating factor/s lessen/s the incident? (A mitigating factor is what makes the violation less. Examples are admitting immediately, prior good record, first violation, etc). If there is damage, how much is it? If damage is image, what is its effect? Is/are the employee/s guilty or not of the violations? If he/she/they is/are, are they equally liable? If not who has the highest accountability? Who has the least? Finally, write your recommendation if sanction shall be issued or not, and if so maximum sanction or reduced sanction. Seek approval from management of your recommendation.This way too, you will have a document approved (or disapproved) by management, which in turn is your basis for writing the Disciplinary Action Notice. TO : write the name of the employee. THRU : write the name of the Department Head or Manager of the employee investigated. Relative to the notice to explain memo issued to you on (write the date and time of the incident) at (write the location of the incident), re: (incident and alleged violation). Per our company code of conduct (or discipline) this falls under (specify the rule number and the violation). With the corresponding disciplinary action of First Offense or Second or Third or so on (write the specific sanction). We received your written explanation on (specify the date), and we also invited you for an admin. meeting held on (specify the date) to which you have given another opportunity to explain your side. effective effectivity date (for termination only). Noted by: Next officer up. CC : 201 File (If there is a Union and the employee is a Union Member, add the “Union” to the CC). Once the notice has been signed by all concerned, serve the notice of decision to the concerned employee. Let him/her acknowledge by writing his/her name, date of receipt and signature, and give them a copy. The other copy should be filed to employees 201 file. For cases of Warning and suspension, the immediate superior of the employee usually issues the notice of decision. For cases of Dismissal, the immediate superior of the employee with the HR/IR/LR head (and if Union employee, an Union Officer). What to do in case employee refuses to receive? Have employee’s supervisor (and if there is a Union, a Union Officer) witness the refusal, and have them write and sign “Employee refuses to receive” with their name and signature. Alternately, send an original copy of the notice of decision in a sealed enveloped to the last know addresses of the employee/s sent via registered mail with return card through the Post Office. (The registered mail notice and the return card are placed in the 201 file). Please be advised, after reviewing the facts of the case and your explanation, we found no substantive evidence to support a violation. Noted by (next level officer). After all have signed, issue copies to the employee and all those in CC. Former Member of the Philippine Society for Training and Development. Former Vice-President of People Management Association of the Philippines (PMAP) Calabarzon Chapter. Former Auditor of the Association of Human Resource Managers (AHRM) in the Hotel and Restaurant industry. good day! may tanong lang po sana ako, may instances po ba na nababago pa yung penalty or decision during an admin hearing for termination? salamat po. We have recently issued an NTE to an employee who has incurred several attendance occurrences while on training. He has responded prior to the deadline, with his written explanation and attachments (medical certificates). Though we are keen to giving the employee another chance despite all his violations, should we still conduct an official admin hearing as we are considering to only issuing him a final written reprimand? Should the final written warning be in a form of Notice of Decision (if no hearing is necessary) or a final written reprimand notice should suffice? An admin meeting is optional, but a must when terminating an employee. If you’re using a form for NTE and NOD, attach in your NOD the final reprimand, otherwise, NOD and the final reprimand can be one and the same.